Pen, ink and wash map of the island of Nevis and the coastline of the island of St Christopher ? more commonly known as St Kitts. 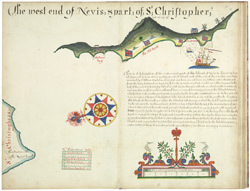 Moltons Bay, the Old Road and Charles Town are all depicted on Nevis. Many small buildings (probably houses) are shown; there are also 2 windmills and a larger building which is most likely to be the Governor's House. Nevis was first settled by the British in 1628, but in 1629 the Spanish captured it, beginning over 200 years of struggles between the English, Dutch and Spanish governments for control of the island and its cotton and sugar production. This map was drawn in 1684 and has an English ship in the western harbour. It also features 5 Union flags.